The Cricut die cutting machine is commonly used for scrapbooking. This machine uses specialized dies to cut letters, shapes, and figures out of vinyl or scrapbook paper. Besides using the machine for die cutting, you can also connect this machine to your computer. Once connected, you have the ability to use design software to design your creations before they are cut. Turn off your Cricut machine, and then hook up your Cricut to your computer using a USB cable. One end of the cable plugs into the back of the Cricut machine, while the other end connects directly to your computer. Turn on your Cricut machine. Your computer will automatically detect your machine and install the necessary drivers. If you are prompted to upgrade a driver for your computer, follow the on-screen directions to update the necessary drivers. Once your Cricut is detected by your computer, you will need to install the Cricut Design Studio software. This software has a free trial that can be accessed through the Cricut website. If you would like to purchase your own copy of the software, you can visit any store where Cricut machines are sold. After Design Studio is loaded you have the ability to design what your machine will cut. Press the "cut" option in the Design Studio software and the machine will begin cutting your designs quickly and easily. 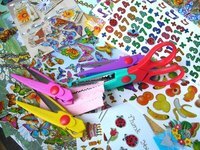 Remove your cutting matte from your machine, and arrange your items for scrapbook use. You may be prompted to update your Cricut machine's firmware by using the Design Studio software. Let the update install the necessary software before continuing use. Make sure that when a driver or update is in process that you do not disconnect your machine or power the computer or machine down.